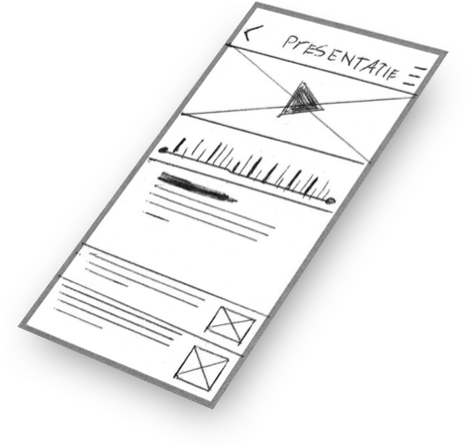 A platform for conference visitors to capture information effortless without getting distracted. 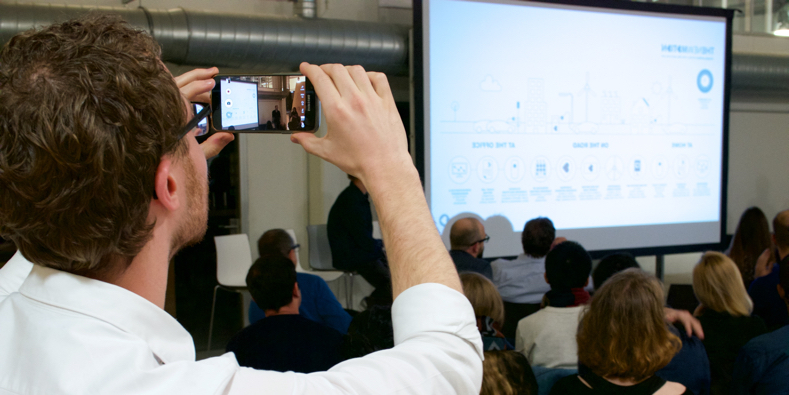 Keymark is a platform for conferences that allows you to capture the most important moments during presentations, without distracting you or others. A single tap is sufficient, while you can focus on the presentation and zoom in later on. During my graduation internship, I learned how distraction (i.e. flash photography) could lead to loss of knowledge gain. By researching distraction and memorizing information from a neurological perspective, while working together with attendees, I created an efficient solution. The problem isn’t always visible. Although the project’s origin came from distraction during conferences, the actual problem was found during a follow-up research. To get a better understanding of the contextual environment, I did research about brains and discovered distraction causes an interruption in the pre-frontal cortex, preventing the brain from storing memories. As a result, the solution required the interaction with the solution has to be redesigned so actions can be performed naturally, without the lose of focus. A variety of concepts have been sketched out, prototyped and tested to try various methods of capturing the most important information. VR, 360 cameras, paper cards.. Both physical and digital solutions have been tried. Although some arguments were held against a smartphone solution, based upon user tests, the prototype scored best in both the categories of ‘solving the problem’ and ‘loss of focus’. Keymark is split into two main parts: during the presentation and afterwards. Instead of your own captures, it relies on the venue’s equipment as a source for media playback. 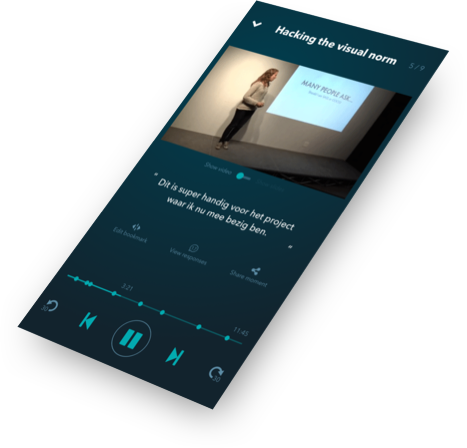 Based upon user testing, audio is already sufficient, which is recorded in 90% of the conferences. 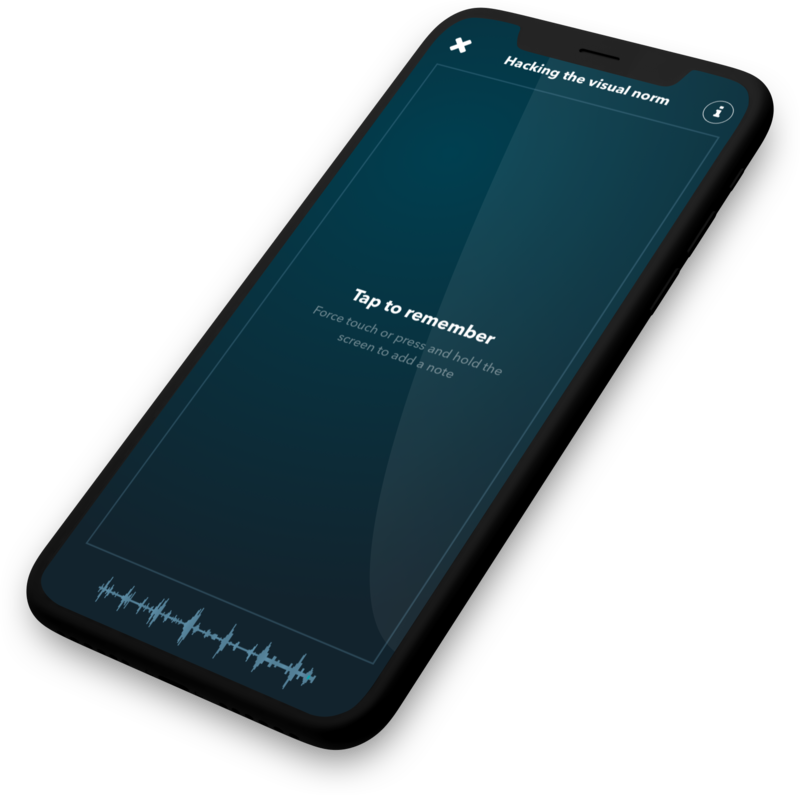 Instead of writing anything down or taking a photo, you simply continue watching the presentation and effortlessly tap your phone’s screen to mark the moment when it is of interest. This way you can keep your focus. As brain studies have shown, repetition is the key to memory. Rewatching later on not only helps you save the information, but also ensures all relevant information is obtained in a suitable pace. Not only the app itself had to be simple, but especially the interaction had to be. I’ve reached out to the drawing board many times to incorporate various interaction patterns and tested those to find the balance in usability and the required attention for that interaction. Besides the capture screen, many other chapters have been redesigned multiple times to make it great. Instead of the regular white User Interface, a dark UI colour palette has been created that was still usable in the dark, but doesn’t create a spotlight for surrounding spectators. The brightness will automatically match the local ambiance. 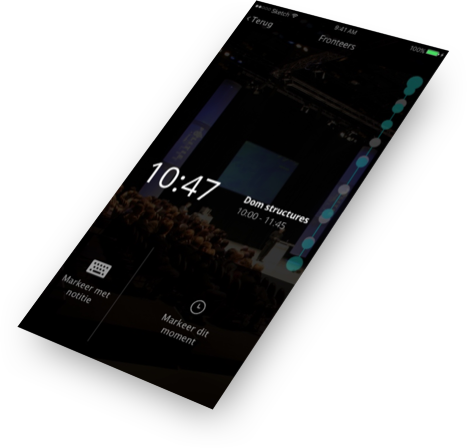 During a presentation, the capture screen is additionally dimmed to prevent distraction and preserving battery life so the screen can remain turned on and available. 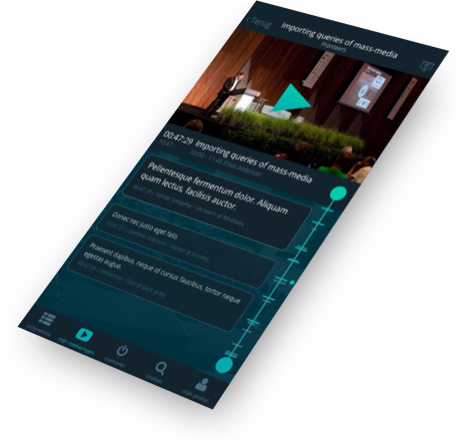 Enhancing the local area, iBeacons are used (when installed at the venue) to automatically recognize the event, navigate the user and automatically open the ‘capture’ page when entering a presentation. When the user has left the premise, the interface will hide irrelevant screens and promotes the ‘watch back’ features. Directly once you enter the venue the line-up of the event is loaded. Here you’ll see all activities, sort by date or type of field, as well asl filter the fields of interest. Add items to your list and create your own personal line-up. 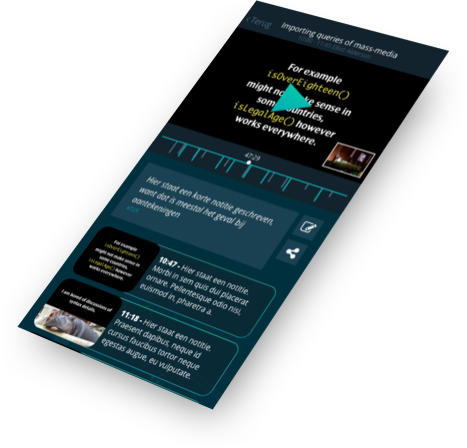 By real-time analyzing the marked moments of the audience a timeline, Heartbeat called, can be created showing the most interesting moments. Even if you missed the show, you see what’s important. Whether it was a quote, a joke, a 10 minute chapter or an important note: simply move the sliders after the show to resize the length of the clip. Make it either long or short enough for yourself or share with others. I wish I had this app three weeks ago. Saw a lot, missed a lot. This app could be both personal and for businesses a life saver. Final experiments have been deducted to validate both specific areas and the concept as a whole to conclude this project. 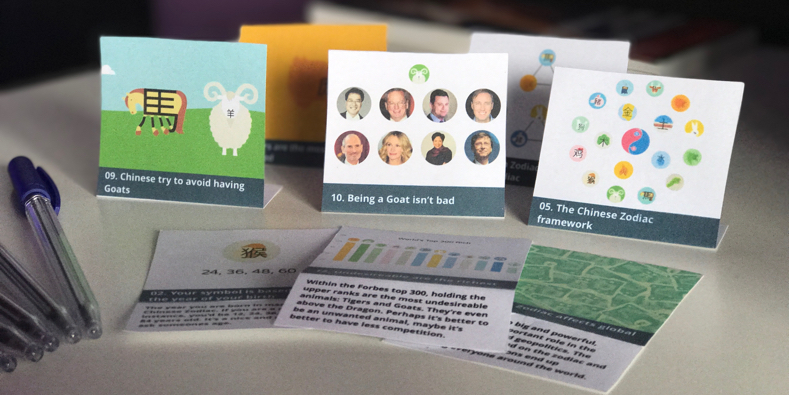 As a result, 82% of the subjects have said they would like to have this product on their next conference visit. This whole graduation project has also been reviewed by committee and been rated as “unique in it’s area” and “a new perspective to capturing knowledge”. Click here to read my graduation thesis (Dutch). 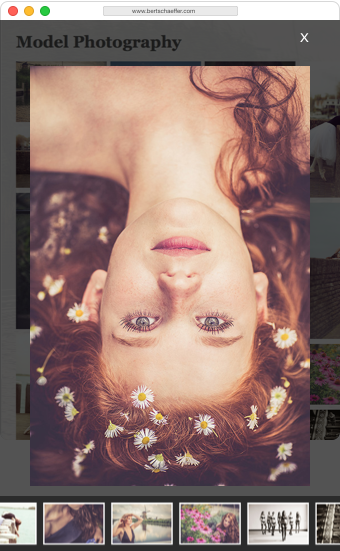 Beautiful website redesign for a professional photographer. Reconnecting cord-cutters with the NOS on a per-context basis. You have an idea that hasn’t seen reality yet or a product that is in need of refining. Whether you seek concept sketching, designs thinking, motion creation, prototype generation or product building: I’m the user experience designer you seek.